When you’re craving a luscious cut of beef or the unforgettable seafood, SW Steakhouse will linger in your memory long after the meal is complete. Inspired by the award-winning SW Steakhouse in Las Vegas, this tantalizing menu is served in an elegant dining room enhanced with details that celebrate this unforgettable experience. SW Steakhouse offers succulent USDA Prime steaks from America, Black Angus beef from Australia, or exclusive beef direct from Japan. In the mood for seafood? Our chefs also source the freshest seafood direct from fisherman throughout Southeast Asia and the Pacific, with each catch shipped to Macau within hours of being caught. While you enjoy this delectable meal, every 30 minutes the lights will go down, a hush will fall over the restaurant, and you’ll be captivated by a theatrical show that magically appears in the center of the room. SW Steakhouse: the perfect marriage of memorable food and dazzling entertainment. Calling all beef lovers! 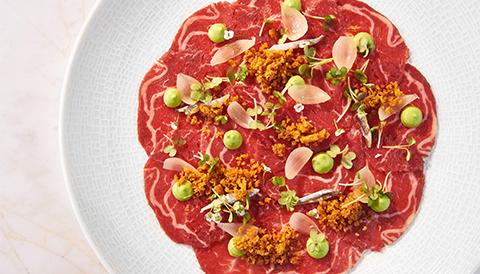 Discover USDA prime beef, served carpaccio and in a range of specialty beef dishes prepared with delicious cooking methods that showcase the best flavor and texture of each cut.